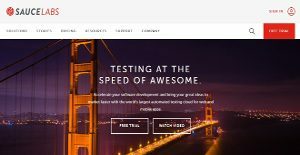 Sauce Labs is one of the most popular cloud-based application testing platforms which offers its services to enterprises (large or small), and open source developing teams. It offers both automated and manual testing of web and mobile applications for more than 800 browser platforms and mobile devices (android and iOS). The infrastructure offered by Sauce Labs is reliable and compatible, with the new technology integrations such as Selemium, Appium, and JS Unit. Sauce Labs works daily to run tests and ensure the infrastructural compatibility, functionality, and performance of the applications. With the use of screenshots, open source codes, logs files, and videos, Sauce Labs helps the developers to sort out issues and bugs with a secure testing platform. Altogether, it’s one of the competent cloud-based platforms which caters to an efficient and results-oriented application lifecycle management. Sauce Labs offers valuable and powerful cloud-based capabilities for testing mobile and web applications. It’s simple yet advanced based on the agile frameworks combined with open source code methodology. Hence, delivering the right set of tools to developers and testers to run tests across different platforms, browsers, and integrations. With automated testing, Sauce Labs accelerates and optimizes the tests by running them through console logs, metadata, and Selenium with complete lists of compatible commands. This helps in obtaining the responses and test results as faster as possible. For mobile devices, the simulator and emulator testing can be amplified through the automated test runs of Sauce Labs, which makes it quite cost effective for the businesses to maximize test results and coverage without using the real device platforms. Many a times, during application development errors and bugs, occur which slow down the whole process of application development. Sauce labs provide the cloud-based platform which not only diagnoses these errors but also streamlines the resources and capabilities for resolving the issues. The wide scope of open source coding brings freedom and innovation for the design, architecture, and infrastructure of the applications. Through this, the whole community of developers can work with the open coding framework of Selenium. If you are considering Sauce Labs it may also be beneficial to investigate other subcategories of Best Test Management Software gathered in our database of B2B software reviews. There are popular and widely used applications in each software group. But are they necessarily the best fit for your enterprise’s specific needs? A trendy software solution may have thousands of users, but does it present what you require? For this reason, do not blindly spend on popular systems. Read at least a few Sauce Labs reviews and consider the elements that you want in the software such as the fees, main functionality, available integrations etc. Then, select a few systems that fit your wants. Check out the free trials of these platforms, read online reviews, get clarifications from the seller, and do your homework meticulously. This profound research is certain to aid you choose the finest software platform for your organization’s specific needs. How Much Does Sauce Labs Cost? We realize that when you make a decision to buy Test Management Software it’s important not only to see how experts evaluate it in their reviews, but also to find out if the real people and companies that buy it are actually satisfied with the product. That’s why we’ve created our behavior-based Customer Satisfaction Algorithm™ that gathers customer reviews, comments and Sauce Labs reviews across a wide range of social media sites. The data is then presented in an easy to digest form showing how many people had positive and negative experience with Sauce Labs. With that information at hand you should be equipped to make an informed buying decision that you won’t regret. What are Sauce Labs pricing details? What integrations are available for Sauce Labs? Cons: There is nothing much I do not like, except the problem with their manual VMs that are very slow to use and it would be great if they could make their design better. Pros: Sauce labs offers many platforms for running tests, and support for all great frameworks and it works great with Jenkins. I love its flexibility because it can be used in many ways. It has dedicated UX team and they really care of their customer’s experience and they do everything to improve themselves, their engineers are very responsive and knowledgeable. Cons: I don’t like that when their infrastructure code is updated no one gets notification about the update. So, I don’t update anything and I face some breaking issues or test failures. So I have to figure out what’s going on and what went wrong and where, this is time wasting process and I end up with sending customer support ticket to the Sauce Labs. If you need more information about Sauce Labs or you simply have a question let us know what you need and we’ll forward your request directly to the vendor.